It's my friend's birthday on Wednesday and me and the rest of our friends have something awesome planned for him that involves being out of the country for a couple of days (he has no idea where we're going, so I won't say just in case he reads this, the sneaky blighter). So if I don't speak to you before, though I imagine I will, have a fantastic Christmas everyone and thanks for your support this year. Trollish Delver salutes you. I've already told you how much I like the Risus system. It's simple, versatile and can fit to any genre. With that in mind, I'm thinking of running a Marvel supers game in the new year, so I've written up some characters for my players to choose from. If you have your own you want to put forward then leave me a comment. Description: Hardened soldier with a sense of humour. Bucky tries his best to fill the red boots of his hero Steve Rogers. Description: Billionaire businessman who always sticks to his guns, even if it gets him into hot water. Also - awesome tech. Description: Witty web-head who's just an ordinary guy. Y'know, with superpowers. Description: Carol Danvers was normal until she was exposed to radiation that gave her super sweet Kree powers. Description: Norse god in a surgeon's body. He's blonde, speaks funny and can summon lightning KRAKOOOM! It came! I've just been flicking through Out of the Pit, a book that's jam packed with creatures from the Fighting Fantasy universe for use with the Advanced Fighting Fantasy rules. It contains a map of Allansia, 250 creatures and random treasure and monster tables. The artwork is taken straight from the gamebooks, so they're the great quality we've come to expect from the series. I think these awesome monsters deserve a T&T stat conversion - so I'll be putting a few on the blog every now and again. I've focused a few posts lately on Fighting Fantasy, but I've just found out some news that will add another gamebook series for me to obsess over. Fabled Lands has been re-released, at least the first four of the six books, and I've just ordered the first two to play over Christmas. What sets the Fabled Lands series (or Quest series, for my American friends)apart from other gamebooks is the massive open-ended gameplay. There is no overarching quest that you must complete to 'win' the game, like in Fighting Fantasy. Rather, each book contains an area of the game world that you can explore at your own leisure. There are hundreds of quests to undertake, from really short to fairly epic; property to invest in and a fluid economy for you to trade in. You also get to choose from a bunch of classes when you begin your adventure, giving Fabled Lands more depth than your run-of-the-mill gamebooks. There were six books that were originally printed (although 12 were planned), each increasing in difficulty as the series progressed and each with their own theme. If you want to travel to another land then all you need to do is pick up the book that land is set in. Think of each of the sequals as an MMO expansion, adding vast amounts of content for you to roam in. Set in the land of Sokara, shortly after a civil war in which the king was overthrown in a military coup. This background provides the book's two major quests; the player can choose to either help the heir to the throne and his band of partisans regain power, or assist the new leader General Grieve Marlock in crushing the last few pockets of resistance. Other quests involve assassinating the king of the rat-men infesting the sewers in the city of Yellowport, looting treasure from the lair of Vayss the Sea Dragon, delivering packages between the druids of the City of Trees and the Forest of Larun, defeating the Black Dragon Knight in combat to the death and rescuing a trapped god from the summit of Devil's Peak. Set in the prosperous kingdom of Golnir, wealthy from its rich agriculture. A common complaint readers had about the second book was that it was far more difficult to find quests than in the first book. There are still several major quests, however, including slaying a dragon for the Baroness Ravayne (the ruler of Golnir), searching for magical artefacts for the wizard Estragon, bringing to justice a murderer on behalf of his victim's ghost, finding the key of stars to gain access to a treasure filled tomb in the Forest of the Forsaken and making a map of the northern mountains. The quests in the second book have a more whimsical, fairy tale nature to them than those in the first book. This gives Golnir a very strong Merry England atmosphere. Set in the Violet Ocean, which separates the northern continent of Harkuna from the southern continent of Ankon-Konu. Travel is severely restricted without a ship, making it a difficult book to start off in, particularly for less experienced gamebook readers. Over the Blood-Dark Sea is also one of the first in the series to feature regular danger - the player is almost always at risk of pirates, storms and even sea monsters. Key quests include assassinating Amcha, king of the pirates, enrolling at a wizard's college in the city of Dweomer to learn magic, searching for buried treasure on hidden islands and climbing the enormous mountain on Starspike Island. Set in the Great Steppes, an environment of grasslands, plains and tundra similar to Siberia and Mongolia. Key quests include liberating the Citadel of Veris Corin for the King of Sokara (closely linked with quests in The War-Torn Kingdom), releasing the King of Harkuna from his prison underneath the Rimewater (closely linked with quests in The Court of Hidden Faces) and killing the immortal tyrant Kaschuf (based on the legend of Koschei the Deathless) who rules over the village of Vodhya (which requires the player to find and release his soul, hidden on an island in Over The Blood-Dark Sea). This was the first book in the series to introduce the concept of a harsh environment - out on the Steppes, the player must make constant SCOUTING rolls in order to find enough food, and on the northern steppes the player loses one point of stamina a day from the cold, unless they have a wolf pelt to keep warm. I'll be reviewing each book when I've had a play. Hopefully we'll see the remaining two books released soon. 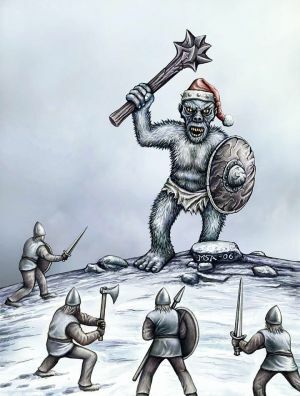 I suppose it's time for Trollish Delver to get festive, so to kick it off here's a holiday themed monster for your T&T game. Special Abilities: Hidden in Pastries - Sugar Plum Fairies are undetectable by any form of magic when they are concealed inside a pie. They can even survive being baked! They get an automatic surprise round when coming out of a pastry. Description: Sugar Plum Fairies are evil little creatures that hide in fruit pies or pastries and lie in wait for a family to tuck into the violent dessert before jumping out and unleashing magic fire on its victims. It has become festive tradition to stab a hot pie a few times with a fork just in case one of these little blighters is hidden inside. As the nights grow dark and the winter chill sets in, there's never been a better time to curl up with a good Fighting Fantasy adventure and a hot chocolate by the fire. Here's what's been happening in November in the world of Titan. Wizard have released the covers for two revised adventures that will be dropping in February: Curse of the Mummy and Forest of Doom. I think they look awesome. There has been more information released about the upcoming Talisman of Death on the Playstation Network. Check out these images and details to whet your appetite. Are you a bit out of pocket because of all the Christmas spending, but you want to play some original Fighting Fantasy material? Then fear not, because Shane Garvey, R M Kawano and Phil Sadler have you covered with their ongoing effort called Destroyer of Worlds. It's free!